Back in my hometown of Pennsylvania, I've sought out my old friends and fellow potters. In the process of re-connecting, was fortunate enough to receive a position at Carlisle Arts Learning Center as the Ceramics Studio Program Facilitator. While at the Center, I caught up with a potter friend, Kurt Brantner who teaches at the center, and was invited to put some work in his "White Rocks Wood Kiln". I've known Kurt since my days of firing the Jack Troy wood kiln at Juniata College and it was a great pleasure to fire with him again. 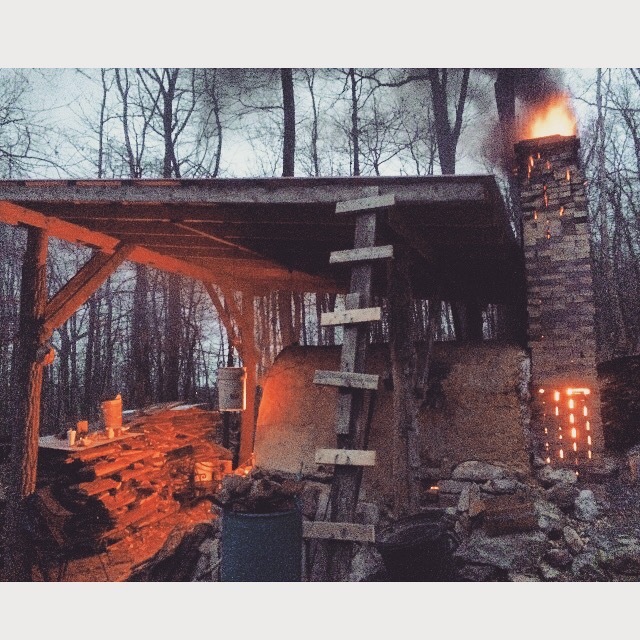 His kiln, built in November of 2014, is located in the scenic Cumberland Valley area of PA. As a studio potter dedicated to the process and aesthetic of wood firing, he fires his kiln about every other month. Pots that are fired in a wood kiln are blushed by flame and ash, each pot responding uniquely to the river of flame moving throughout. Rich textures are built from ash deposits and melt, glazes flash, and bare clay displays a rainbow of coloration ranging from red to purple. The labor intensive process of firing the kiln for three days is worth the reward of a kiln full of gems. Planning out the how the pots will be stacked in the kiln. It's important to consider the interior arrangement to ensure the best effects from the flame and ash. All loaded up, almost entirely according to plan! Sometimes the pots have a way of telling you where they want to go. Lovely gems from firing number 7. Arguably, the most exciting part of the clay process is firing. Partly because it's like Christmas every time the kiln is opened, and also because I think each of us is a closet pyromaniac that gets unreasonably excited when firing atmospheric kilns. I, for one, love the complete involvement in the firing while simultaneously giving up a large part of control to the "kiln gods", crossing your fingers and hope you're pots are "the chosen ones", blessed with beautiful surfaces. I've been fortunate enough, in my relatively short ceramic career thus far, to be involved in many atmospheric kiln firings. First, at Juniata College, I participated in firing the historic wood kiln built by Jack Troy, as well as our trusty soda kiln (which quickly became my favorite). I spent a few weeks at Watershed Center for Ceramics Arts in Newcastle, Maine and had the opportunity with fellow Juniata students to fire their salt kiln. The UAF Waste oil/Soda Kiln! Now, as a student at UAF, I've been a part of many many more atmospheric firings, which contribute to the luscious surfaces of my work. 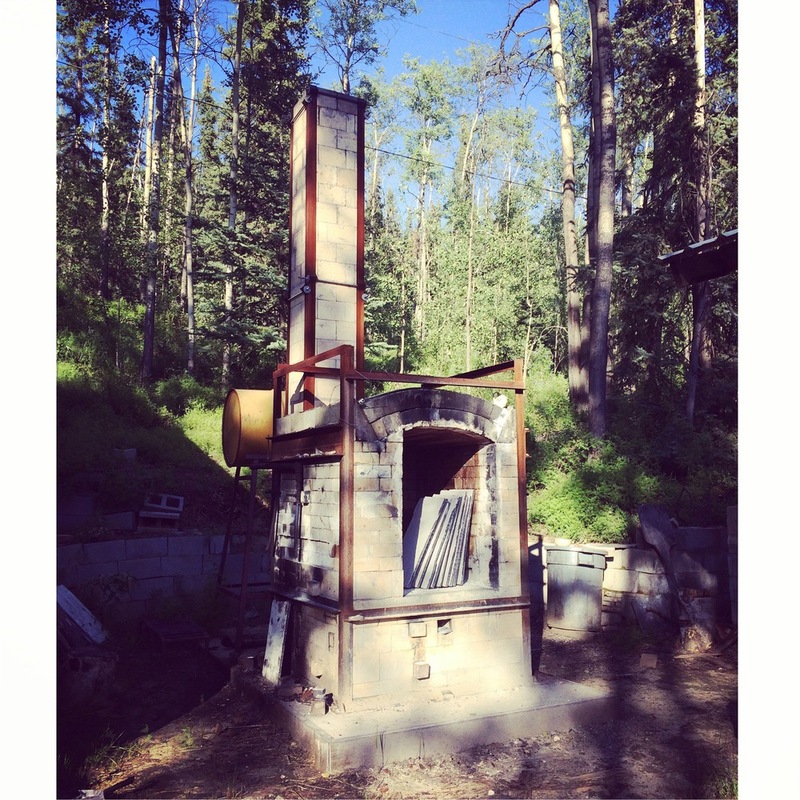 Here, as far as atmospheric kilns go, there a lot of options; we have two gas kilns, an anagama, a fast fire wood kiln, salt kiln, and my personal favorite and newest addition, the waste oil soda kiln! This kiln is killer! Not only does it give the juicy and nubile surfaces typical of a soda kiln, it's fired sustainably with veggie oil donated by the Faribanks Princess Lodge Restaurant. The kiln has a pretty ingenious design. The kiln itself is designed to fire from two primary fuel sources. First wood, to get the kiln hot enough, and then converted to waste oil, mid-firing, to get to temperature (about 2400 degrees). Bringing new meaning to pumping oil in Alaska! First, we have to screen the oil and pump it into the large yellow barrel that's located behind the stack. The barrel is double walled, for a few reasons; including the ability to install a heater so the oil doesn't solidify and can flow easily into the kiln in October..yes that's right things are freezing up as early as October! Since the oil doesn't combust until the temperature reaches 621 degrees F, we have to begin the firing with wood. It's important to wait until we get to at least to about 1200 degrees F before we pull out the grates (of course, along with the grates comes a lot of ash!) so to prevent too much heat loss we need to go above and beyond! Now we're cooking with oil! The oil is gravity fed from the barrel behind the stack, and comes down into tubes that are inserted into holes in the side of the kiln. The tubes are angled so that they extend into the firebox. The oil drips down onto the plates, and once they've heated up (about ten minutes or so) the oil combusts! Christmas! Unloading the kiln, as always is the most exciting! We change one fire box at a time and in about an hour, we will have successfully switched to solely firing with the waste oil! There are globe valves that control the rate of oil flow. The key is to ensure that the flow is low, slow, and steady. (Yes, we do get the occasional french fry or spice clump, but that's why we screen!) The firing takes anywhere from 8-12 hours, but with good company, and great pizza from the pizza oven next door, time flies by!